Come paint in one of New Mexico’s favorite painting destinations! 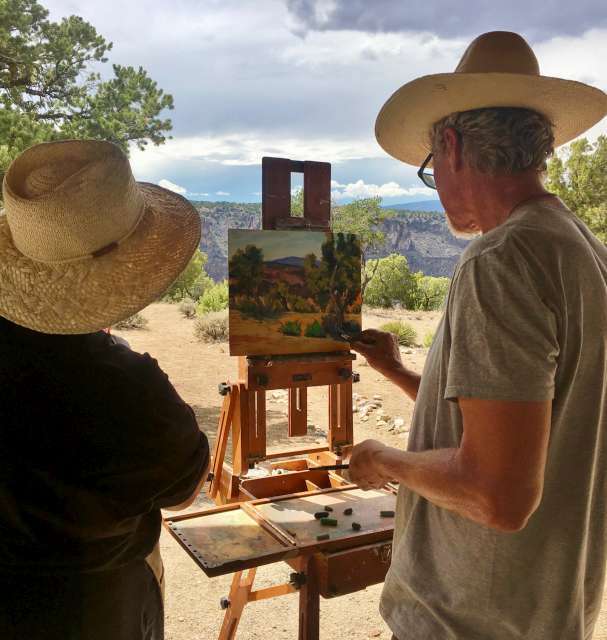 Artists from around the southwest, and the world, gather to paint the dramatic landscape of the Rio Grande del Norte National Monument, plus, the charming historic sites around the remote village of Questa. This friendly festival is six days which includes 4 days of open painting, workshops and demos, a Quick-Draw event, and a two-day Art Show with awards and prizes! The Art show will be held in the nearby mountain town of Red River, bringing this fresh mix of artworks to the largest nearby audience of collectors. The art deco style Brass Rail theater is the unique venue. Tuesday through Friday offer open painting, demos and workshops. On Friday evening works are turned in for hanging the show, Saturday sees a Quick-Draw with awards in the morning and the highly-anticipated artists award reception from 5-7pm. Want to participate? Artist registration is through Eventbrite. More information at WildRiversPleinAir.com or call Peggy at 505-974-5314.